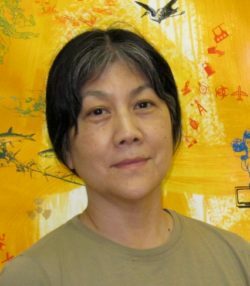 Tomie Arai (1949- ) is a third generation Japanese American artist and activist who has been challenging the mainstream art community and advocating public and community art since the late 1960s and 1970s. 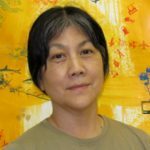 She was involved with the Basement Workshop, an Asian American artists’ collective, in the 1970s, and from there continued her community work as a resource center coordinator and mural director at the Cityarts Workshop. She later worked as a graphic artist for Citibank’s Graphic Support program, where she designed promotional materials for community groups. She has been a recipient of numerous grants and residencies and has exhibited her work at museums such as the Museum of Modern Art, Whitney Museum of American Art, Bronx Museum of the Arts, and the Japanese American National Museum. Arai has also completed numerous public works on both local and national levels. These works often incorporated oral histories, family photographs, and other historic/archival materials to explore the relationship between art and collective memory. Along with her art, Arai meticulously documented the activist and art scenes in which she participated by amassing a sizable personal archive. The Tomie Arai Papers total twenty-five linear feet and document Arai’s engagement with public art, artist collectives, and local communities as an artist-activist from 1971 to the present. The majority of the collection centers around Arai’s art and art-making process. This includes actual artwork as well as exhibition drafts and proposals, research files, exhibition announcements, correspondences, and catalogs. The Tomie Arai Papers are located at the NYU Fales Library & Special Collections. A finding aid for the collection is in process.